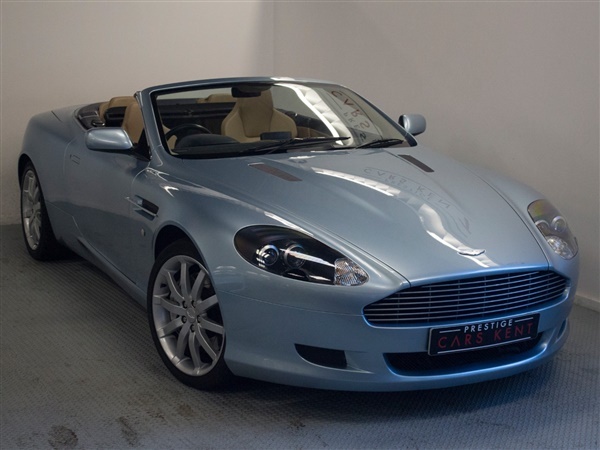 We are delighted to offer this beautiful low mileage 2005 Aston Martin DB9 Volanted. Presented in Metallic Blue. This car is in exceptional condition throughout and benefits from a great specification list including, Projector Headlights with Washers, Multi Spoke Gloss Silver Alloy Wheels, Silver Aston Martin Brake Calipers, Dual Exit Exhaust System, Reverse Parking Sensors, Electronic Folding Roof, Paddleshift, Push Button Start, Electric Windows, Electric Mirrors, Cruise Control, Trip Computer, FM Radio, Full Colour Satellite, CD Player, Air Conditioning, Heated Front & Rear Screen, Sport Mode, Electric Seats, Heated Seats, Full Leather Dashboard, Cruise Control. To discuss this excellent DB9 in further detail please don't hesitate to give us a call on the number as shown above.,We are delighted to offer this beautiful low mileage 2005 Aston Martin DB9 Volanted. Presented in Metallic Blue. This car is in exceptional condition throughout and benefits from a great specification list including, Projector Headlights with Washers, Multi Spoke Gloss Silver Alloy Wheels, Silver Aston Martin Brake Calipers, Dual Exit Exhaust System, Reverse Parking Sensors, Electronic Folding Roof, Paddleshift, Push Button Start, Electric Windows, Electric Mirrors, Cruise Control, Trip Computer, FM Radio, Full Colour Satellite, CD Player, Air Conditioning, Heated Front & Rear Screen, Sport Mode, Electric Seats, Heated Seats, Full Leather Dashboard, Cruise Control. To discuss this excellent DB9 in further detail please don't hesitate to give us a call on the number as shown above.